The Calvary University Warriors jumped out to a 33-23 halftime lead and never looked back as they picked up a 75-57 road win over Union College on Saturday night in Lincoln, Nebraska. Calvary played terrific fundamental defense to hold Union to 23 first-half points. Shots were contested aggressively and the team played solid help defense. The Warriors moved to 3-4 on the season. 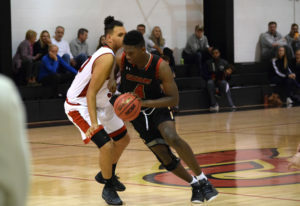 The Warriors bounced back after a tough loss to Champion Christian College on Tuesday night. Calvary and Union met earlier this season with the Warriors capturing a 79-49 win in Kansas City. As the Warriors took the court, the team was looking to climb back towards the .500 mark. Braydon Unruh and Ben Jones sparked the Warriors offense as both players hit some big shots during the second half surge that helped the team seal the victory. The team continued to ride their defensive momentum throughout the second half as they forced Union into tough looks and limited second-chance opportunities. Next up, the Warriors travel to Joplin, MO Tuesday night for a contest against MCCC opponent Ozark Christian College.